Logo used for the NRHP. Old Slater Mill, a historic district in Pawtucket, Rhode Island, was the first property listed in the National Register on November 13, 1966. 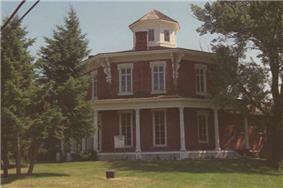 The Loren Andrus Octagon House in Washington, Michigan has been on the NRHP since September 3, 1971. 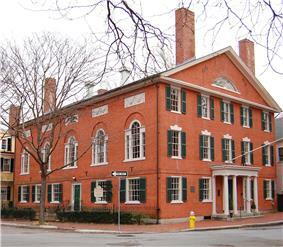 Built in 1800 by Samuel McIntire in Salem, the Stephen Phillips House is operated as a historic house museum by Historic New England and open for public tours. The National Register of Historic Places (NRHP) is the United States federal government's official list of districts, sites, buildings, structures, and objects deemed worthy of preservation. A property listed in the National Register, or located within a National Register Historic District, may qualify for tax incentives derived from the total value of expenses incurred preserving the property. The passage of the National Historic Preservation Act (NHPA) in 1966 established the National Register and the process for adding properties to it. Of the more than one million properties on the National Register, 80,000 are listed individually. The remainder are contributing resources within historic districts. Each year approximately 30,000 properties are added to the National Register as part of districts or by individual listings. For most of its history the National Register has been administered by the National Park Service (NPS), an agency within the United States Department of the Interior. Its goals are to help property owners and interest groups, such as the National Trust for Historic Preservation, coordinate, identify, and protect historic sites in the United States. While National Register listings are mostly symbolic, their recognition of significance provides some financial incentive to owners of listed properties. Protection of the property is not guaranteed. During the nomination process, the property is evaluated in terms of the four criteria for inclusion on the National Register of Historic Places. The application of those criteria has been the subject of criticism by academics of history and preservation, as well as the public and politicians. Some examples are Fallingwater, Robie House, Martin Luther King Jr's grave, and Old Slater Mill. On October 15, 1966 the Historic Preservation Act created the National Register of Historic Places and the corresponding State Historic Preservation Offices (SHPO). Initially, the National Register consisted of the National Historic Landmarks designated before the Register's creation, as well as any other historic sites in the National Park system. Approval of the act, which was amended in 1980 and 1992, represented the first time the United States had a broad-based historic preservation policy. The 1966 act required those agencies to work in conjunction with the SHPO and an independent federal agency, the Advisory Council on Historic Preservation (ACHP), to confront adverse effects of federal activities on historic preservation. To administer the newly created National Register of Historic Places, the National Park Service of the U.S. Department of the Interior, with director George B. Hartzog, Jr., established an administrative division named the Office of Archeology and Historic Preservation (OAHP). Hartzog charged OAHP with creating the National Register program mandated by the 1966 law. Ernest Connally was the Office's first director. Within OAHP new divisions were created to deal with the National Register. The division administered several existing programs, including the Historic Sites Survey and the Historic American Buildings Survey, as well as the new National Register and Historic Preservation Fund. "National Register Information System", National Register of Historic Places, National Park Service. Retrieved July 11, 2011. Shrimpton, Rebecca H., ed. "How to Apply the National Register Criteria for Evaluation," National Park Service, (1997) National Register Bulletin No. 15, Washington, DC: Government Printing Office. Retrieved April 11, 2007. Title 36, U.S. Code of Federal Regulations, specifically Part 60, National Archives and Records Administration. Retrieved April 11, 2007. ^ a b c d e National Historic Preservation Act of 1966, Public Law 102–575, National Register of Historic Places, Official site. Retrieved March 21, 2007. ^ a b c d Mackintosh, Barry. "The Historic Sites Survey and National Historic Landmarks Program: A History," (PDF), National Historic Landmarks Program, Official site. Retrieved March 23, 2007. ^ a b Ferguson, T. J. "Native Americans and the Practice of Archaeology," (JSTOR), Annual Review of Anthropology, Vol. 25. (1996), pp. 63–79. Retrieved March 23, 2007. ^ a b c d e f g Fisher, Charles E. (1998). "Promoting the Preservation of Historic Buildings: Historic Preservation Policy in the United States". ^ a b Scarpino, Philip V. "Planning for Preservation: A Look at the Federal-State Historic Preservation Program, 1966–1986 (in The Intergovernmental Politics of Preservation)," (JSTOR) The Public Historian, Vol. 14, No. 2. (Spring, 1992), pp. 49–66. Retrieved March 21, 2007. ^ a b c Bearss, Edwin C. "The National Park Service and Its History Program: 1864–1986: An Overview (in The National Park Service and Historic Preservation)," (JSTOR), The Public Historian, Vol. 9, No. 2, The National Park Service and Historic Preservation. (Spring, 1987), pp. 10–18. Retrieved March 22, 2007. ^ a b c Hertfelder, Eric. "The National Park Service and Historic Preservation: Historic Preservation beyond Smokey the Bear (in Commentary: How Well Is the National Park Service Doing? )," (JSTOR), The Public Historian, Vol. 9, No. 2, The National Park Service and Historic Preservation. (Spring, 1987), pp. 135–142. Retrieved March 21, 2007. ^ "About the National Register". National Register of Historic Places. National Park Service. Retrieved March 22, 2007. ^ a b "What are the results of a listing?". National Register of Historic Places. National Park Service. Archived from the original on February 15, 2008. Retrieved August 27, 2013. ^ "Historic Preservation Tax Incentives," Technical Preservation Services, National Park Service, Official site. Retrieved March 22, 2007. ^ About the Historic Preservation Tax Incentives, Federal Historic Preservation Tax Incentives, Technical Preservation Services, National Park Service, Official site. Retrieved March 22, 2007. ^ "Save America's Treasurers: FAQ" National Park Service. Retrieved March 23, 2007. ^ "Save America's Treasures". National Trust for Historic Preservation. Retrieved 1 March 2013. ^ "2006 Federal Save America's Treasures Grants," (PDF), National Park Service, United States Department of the Interior. Retrieved April 12, 2007. ^ "Department of Transportation Act," (PDF), National Park Service, Official site. Retrieved March 21, 2007. ^ a b c d e f "Criteria Bulletin," National Register of Historic Places, Official site. Retrieved March 21, 2007. 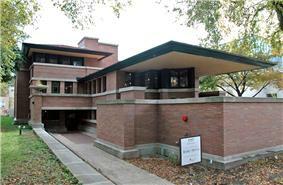 ^ "Robie House," (PDF), National Register of Historic Places Nomination Form, Illinois Historic Preservation Agency. Retrieved April 11, 2007. ^ a b c d e f g h "How to Apply the National Register Criteria for Evaluation," (PDF), National Register Bulletins, National Park Service. Retrieved March 22, 2007. 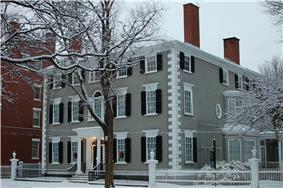 ^ American Legation, NHL Database, National Historic Landmarks Program. Retrieved April 11, 2007. ^ a b c d Gray, Oscar S. "The Response of Federal Legislation to Historic Preservation," (JSTOR), Law and Contemporary Problems, Vol. 36, No. 3, Historic Preservation. (Summer, 1971), pp. 314–328. Retrieved March 21, 2007. ^ "Section 106 Summary," Advisory Council on Historic Preservation, Official site, April 26, 2002. ^ "Federal, State and Local Historic Districts, National Park Service. Retrieved March 21, 2007. ^ Lee, Antoinette J. and McClelland Linda F. "How to Complete the National Register Multiple Property Documentation Form, (PDF), National Register Bulletin, National Park Service. Retrieved March 22, 2007. ^ "National Register of Historic Places: Multiple Property Covers as of 06/01/2014". .
^ Sprinkle, John H., Jr (Spring 2007). ""Of Exceptional Importance": The Origins of the "Fifty-Year Rule" in Historic Preservation". The Public Historian 29 (2): 81–103. 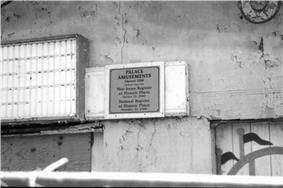 ^ (1987) "Historic district at issue in Omaha," New York Times. 12/13/87. Retrieved 7/8/07. ^ Church sues over historic site, Caren Burmeister, Jacksonville Times-Union, 3/23/99. Retrieved 7/8/11. The limitations of the NHPA are demonstrated when historic properties are destroyed, as when the Jobbers Canyon Historic District in downtown Omaha, Nebraska was demolished in 1987 to make way for a suburban-style corporate campus. As of 1999, there have been 982 properties removed from the Register, most often due to being destroyed. With each passing year a new group of resources crosses the fifty-year threshold, that were before considered “too recent” for listing on the National Register of Historic Places (unless they were exceptionally significant). The preservation of these “underage” resources, has gained increasing attention in recent years. There are several other different types of historic preservation associated with the properties of the National Register of Historic Places that cannot be classified as either simple buildings and historic districts. Through the National Park Service, the National Register of Historic Places publishes a series of bulletins designed to aid in evaluating and applying the criteria for evaluation of different types of properties. Although the criteria are always the same, the manner they are applied may differ slightly, depending upon the type of property involved. The National Register bulletins describe application of the criteria for aids to navigation, historic battlefields, archaeological sites, aviation properties, cemeteries, and burial places, historic designed landscapes, mining sites, post offices, properties associated with significant persons, properties achieving significance within the last fifty years, rural historic landscapes, traditional cultural properties, and vessels and shipwrecks. Historic districts possess a concentration, association, or continuity of the other four types of properties. Objects, structures, buildings, and sites in a historic district are united historically or aesthetically, either by choice or by the nature of their development. 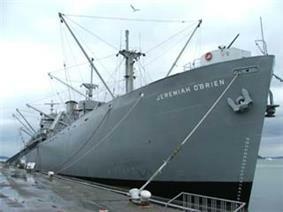 The Liberty Ship SS Jeremiah O'Brien, an example of a ship listed in the National Register. This ship is also a National Historic Landmark. Sites are the locations of significant events, which can be prehistoric or historic in nature and represent activities or buildings (standing, ruined, or vanished). When sites are listed, it is the locations themselves that are of historical interest. They possesses cultural or archaeological value regardless of the value of any structures that currently exist at the locations. Examples of types of sites include shipwrecks, battlefields, campsites, natural features, and rock shelters. Objects are usually artistic in nature, or small in scale compared to structures and buildings. Although objects may be movable, they are generally associated with a specific setting or environment. Examples of objects include monuments, sculptures, and fountains. Structures differ from buildings in that they are functional constructions meant to be used for purposes other than sheltering human activity. Examples include an aircraft, a grain elevator, a gazebo, and a bridge. Buildings, as defined by the National Register, are distinguished in the traditional sense. Examples include a house, barn, hotel, church, or similar construction. They are created primarily to shelter human activity. The term building, as in outbuilding, can be used to refer to historically and functionally related units, such as a courthouse and a jail or a barn and a house. Listed properties are generally in one of five broad categories, although there are special considerations for other types of properties that in any one, or into more specialized subcategories. The five general categories for National Register properties are: building, structure, site, district, and object. In addition, historic districts consist of contributing and non-contributing properties. 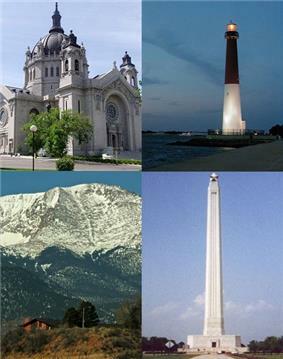 Clockwise from top left: a building, a structure, an object and a site – all are examples of National Register of Historic Places property types. The nomination of individual properties in an MPS is accomplished in the same manner as other nominations. The name of the "thematic group" denotes the historical theme of the properties. It is considered the "multiple property listing." Once an individual property or a group of properties is nominated and listed in the National Register, the Multiple Property Documentation Form, combined with the individual National Register of Historic Places Nomination Forms, constitute a Multiple Property Submission. Examples of MPS include the Lee County Multiple Property Submission, the Warehouses in Omaha, the Boundary Markers of the Original District of Columbia, and the Illinois Carnegie Libraries. Before the term "Multiple Property Submission" was introduced in 1984, such listings were known as "Thematic Resources" or "Multiple Resource Areas." The process begins with the Multiple Property Documentation Form, which acts as a cover document rather than the nomination to the National Register of Historic Places. The purpose of the documentation form is to establish the basis of eligibility for related properties. The information of the Multiple Property Documentation Form can be used to nominate and register related historic properties simultaneously, or to establish criteria for properties that may be nominated in the future. Thus, additions to an MPS can occur over time. The lodge and cabins at White Pines State Park, in Illinois, are part of a multiple property submission. A multiple property submission (MPS) is a thematic group listing of the National Register of Historic Places that consists of related properties that share a common theme and can be submitted as a group. Multiple property submissions must satisfy certain basic criteria for the group of properties to be included in the National Register. The more general language has allowed more properties and parklands to enjoy status as protected areas by this legislation, a policy developed early in its history. The United States Supreme Court ruled in the 1971 case Citizens to Preserve Overton Park v. Volpe that parklands could have the same protected status as "historic sites." The Department of Transportation Act, passed on October 15, 1966, the same day as the National Historic Preservation Act, included provisions that addressed historic preservation. The DOT Act is much more general than Section 106 NHPA in that it refers to properties other than those listed in the Register. In cases where the ACHP determines federal action will have an "adverse effect" on historic properties, mitigation is sought. Typically, a Memorandum of Agreement (MOA) is created by which the involved parties agree to a particular plan. Many states have laws similar to Section 106. In contrast to conditions relating to a federally designated historic district, municipal ordinances governing local historic districts often restrict certain kinds of changes to properties. Thus they may protect the property more than a National Register listing does. While Section 106 does not mandate explicitly that any federal agency director accept the advice of the ACHP, their advice has practical influence, especially given the statutory obligations of the NHPA that require federal agencies to "take into account the effect of the undertaking." Listing in the National Register does not restrict private property owners from the use of their property. Some states and municipalities, however, may have laws that become effective when a property is listed in the National Register. If federal money or a federal permitting process is involved, Section 106 of the National Historic Preservation Act of 1966 is invoked. Section 106 requires the federal agency involved to assess the effect of its actions on historic resources. Statutorily, the Advisory Council on Historic Preservation (ACHP) has the most significant role by Section 106 of the National Historic Preservation Act. The section requires that the director of any federal agency with direct or indirect jurisdiction of a project that may affect a property listed or determined eligible for listing in the National Register of Historic Places, must first report to the Advisory Council. The director of said agency is required to "take into account the effect of the undertaking" on the National Register property, as well as to afford the ACHP a reasonable opportunity to comment. A listing on the National Register of Historic Places is governmental acknowledgment of a historic district, site, building, or property. However, the Register is mostly "an honorary status with some federal financial incentives." The National Register of Historic Places automatically includes all National Historic Landmarks as well as all historic areas administered by the National Park Service. Landmarks such as these include: National Historic Sites (NHS), National Historical Parks, National Military Parks/Battlefields, National Memorials, and some National Monuments. Occasionally historic sites outside the country's borders, but associated with the United States, such as the American Legation in Tangiers, also are listed. An alternate series of plaques. Buildings on the National Register are often listed in local historic societies as well. There are specific instances where properties usually do not merit listing in the National Register. As a general rule, cemeteries, birthplaces, graves of historical figures, properties owned by religious institutions or used for religious purposes, moved structures, reconstructed historic buildings, commemorative properties, and properties that have achieved significance during the last fifty years are not qualified for listing on the Register. There are, however, exceptions to all the preceding; mitigating circumstances allow properties classified in one of those groups to be included. The criteria are applied differently for different types of properties; for instance, maritime properties have application guidelines different from those of buildings. Criterion A, "Event," the property must make a contribution to the major pattern of American history. Criterion B, "Person," is associated with significant people of the American past. Criterion C, "Design/Construction," concerns the distinctive characteristics of the building by its architecture and construction, including having great artistic value or being the work of a master. Criterion D, "Information potential," is satisfied if the property has yielded or may be likely to yield information important to prehistory or history. For a property to be eligible for the National Register, it must meet at least one of the four National Register main criteria. Information about architectural styles, association with various aspects of social history and commerce, and ownership are all integral parts of the nomination. Each nomination contains a narrative section that provides a detailed physical description of the property and justifies why it is significant historically with regard either to local, state, or national history. The four National Register of Historic Places criteria are the following. The Robie House, designed by Frank Lloyd Wright, is an example of a property listed by means of criterion C.
The Holy Resurrection Orthodox Church in Berlin, New Hampshire added in 1979. Mohonk Mountain House, a resort hotel located on the Shawangunk Ridge. Fargo Theatre, a historic theatre in Fargo, North Dakota built in 1920. Sixteenth Street Baptist Church in Birmingham, Alabama received in 2006 a Save America's Treasures Grant. Now the Lexington Historical Museum, built in 1846 and added in 1978. The NHPA did not distinguish between properties listed in the National Register of Historic Places and those designated as National Historic Landmarks concerning qualification for tax incentives or grants. This was deliberate, as the authors of the act had learned from experience that distinguishing between categories of significance for such incentives caused the lowest category to become expendable. Essentially, this made the Landmarks a kind of "honor roll" of the most significant properties of the National Register of Historic Places. Some property owners may qualify for grants as well, for instance the Save America's Treasures grants, which apply specifically to properties entered in the Register with national significance or designated as National Historic Landmarks. The Save America's Treasures office has closed. The United States Congress did not renew the funding for the program for fiscal years 2011 and 2012, and does not plan to re-establish funding. Owners of income-producing properties listed individually in the National Register of Historic Places or of properties that are contributing resources within a National Register Historic District may be eligible for a 20% investment tax credit for the rehabilitation of the historic structure. The rehabilitation may be of a commercial, industrial, or residential property, for rentals. The tax incentives program is operated by the Federal Historic Preservation Tax Incentives program, which is managed jointly by the National Park Service, individual State Historic Preservation Offices, and the Internal Revenue Service. Aside from the 20% tax credit, the tax incentive program offers a 10% tax credit for rehabilitation to owners of non-historic, non-residential buildings constructed before 1936. Until 1976, federal tax incentives were virtually non-existent for buildings on the National Register. Before 1976 the federal tax code favored new construction rather than the reuse of existing, sometimes historical, structures. In 1976, the tax code was altered to provide tax incentives that promote preservation of income-producing historic properties. The National Park Service was given the responsibility to ensure that only rehabilitations that preserved the historic character of a building would qualify for federal tax incentives. A qualifying rehabilitation is one that the NPS deems consistent with the Secretary of the Interior's Standards for Rehabilitation. Properties and sites listed in the Register, as well as those located in and contributing to the period of significance of National Register Historic Districts, became eligible for the federal tax benefits. Properties are not protected in any strict sense by the Federal listing. States and local zoning bodies may or may not choose to protect listed historic places. Indirect protection is possible, by state and local regulations on development of National Register properties, and by tax incentives. The National Register of Historic Places has grown considerably from its legislative origins in 1966. In 1986 citizens and groups nominated 3,623 separate properties, sites, and districts for inclusion on the National Register, a total of 75,000 separate properties. Of the more than one million properties on the National Register, 80,000 are listed individually. Others are listed as contributing members within historic districts. Although not described in detail in the 1966 act, SHPOs eventually became integral to the process of listing properties on the National Register. The 1980 amendments of the 1966 law further defined the responsibilities of SHPOs concerning the National Register. Several 1992 amendments of the NHPA added a category to the National Register, known as Traditional Cultural Properties: those properties associated with Native American or Hawaiian groups. In February 1983, the two assistant directorates were merged to promote efficiency and recognize the interdependency of their programs. 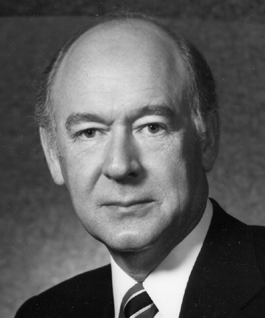 Jerry L. Rogers was selected to direct this newly merged associate directorate. He was described as a skilled administrator, who was sensitive to the need for the NPS to work with SHPOs, academia, and local governments. A few years later in 1979, the NPS history programs affiliated with both the U.S. National Parks system and the National Register were categorized formally into two "Assistant Directorates." Established were the Assistant Directorate for Archeology and Historic Preservation and the Assistant Directorate for Park Historic Preservation. From 1978 until 1981, the main agency for the National Register was the Heritage Conservation and Recreation Service (HCRS) of the United States Department of the Interior.